Ribbon is wonderful. Ribbon comes in every color, print, style, width, and it beautifully serves the purpose of keeping a cellophane bag, with a Petite Caramel Apple inside of it, closed. Not to mention it is inexpensive, easy to use, and readily available. We love ribbon, but we wanted to go beyond ribbon and see what else we could come up with. Sparkly clothespins? Yes! 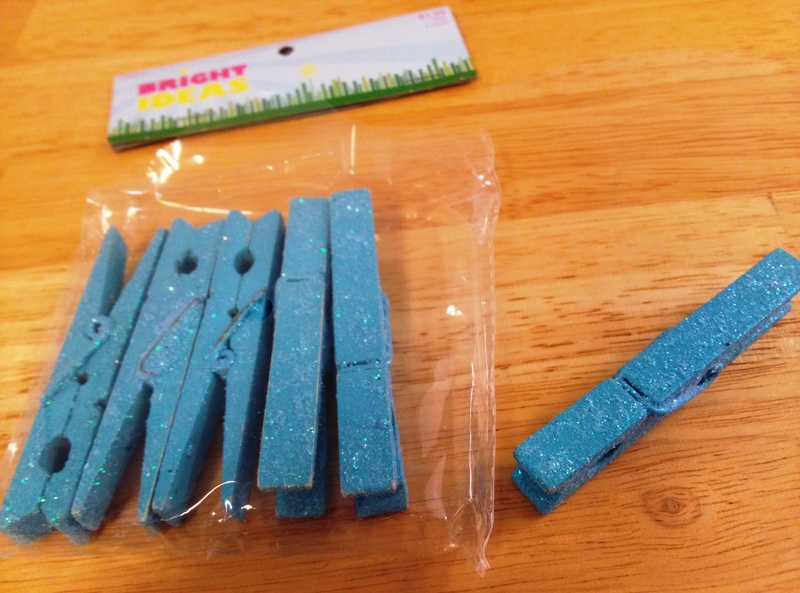 These blue sparkly clothespins came in a package of 6 for $1.99 or around 33 cents each. 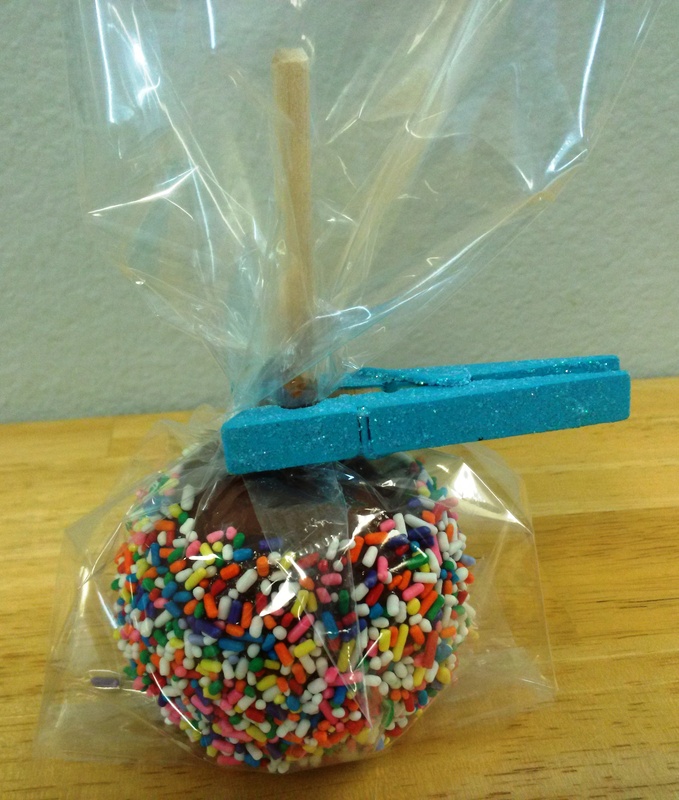 They fit perfectly around a Petite Caramel Apple stick and you could add a piece of clear tape to secure the cellophane bag further. We’re thinking baby shower with this idea! Sparkly seems to be a theme developing in this post. 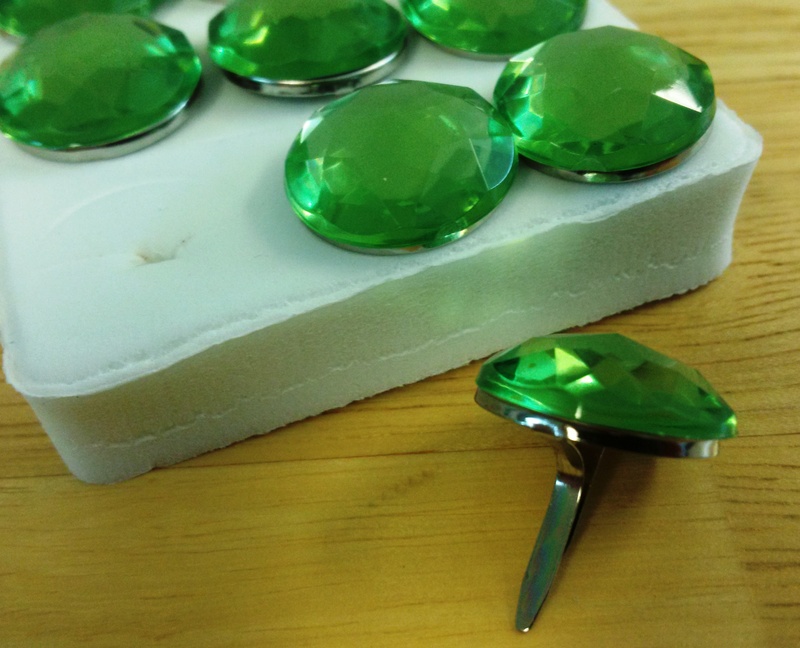 Here are some lovely little sparkly green gemstone brads. 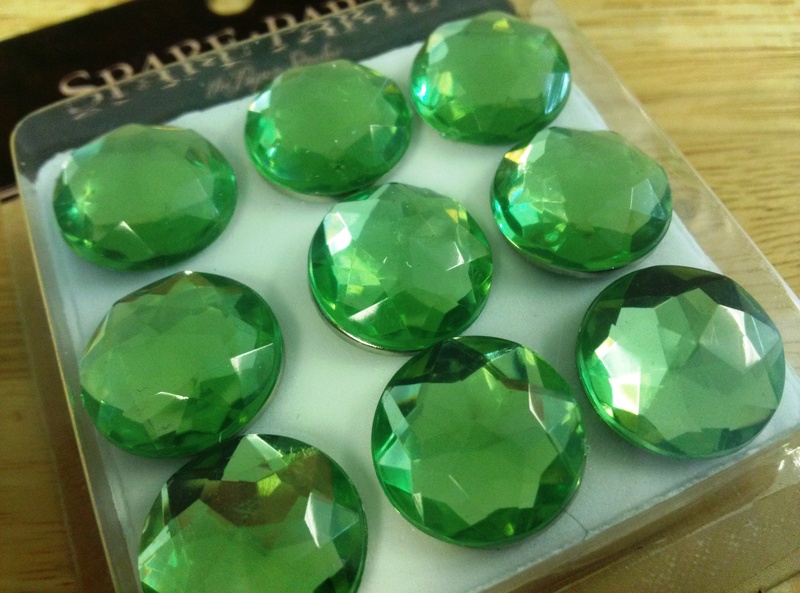 This package contains 9 gemstone brads for $2.99, or around 33 cents each. We found these in the scrapbooking section and they come in a bunch of different colors and shapes and sizes! The backs of these gemstone brads are just like regular brads. 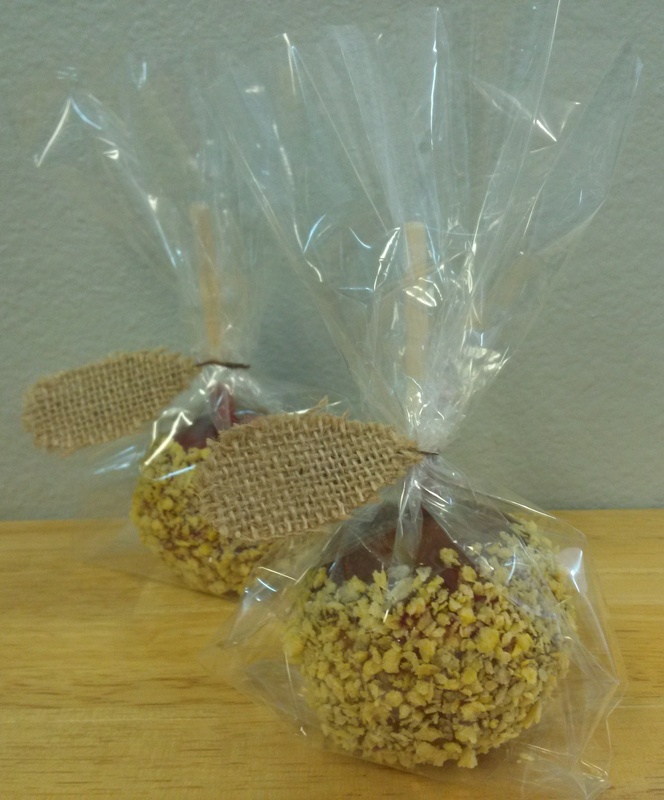 Posted in Caramel Apple Wedding Favors, Daffy Farms, Decorating Ideas, Delicious Pictures, DIY, The Daffy Apple and tagged baby shower, birthday, blue, brad, caramel apple, caramel apples, clothespin, daffy apple, daffy farms, diy, event, gemstone, green, package, packaging, petite, shower, sparkle, sparkly on May 23, 2014 by daffyfarmsblog. 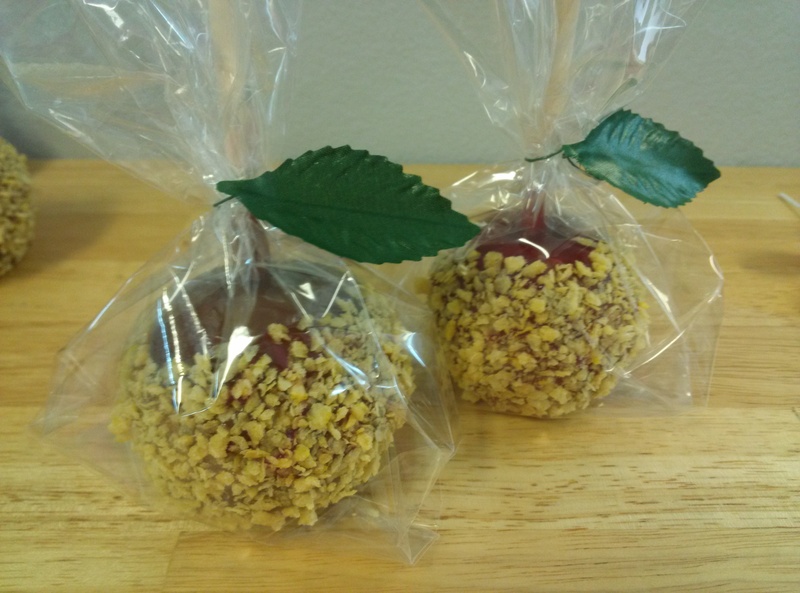 DIY: Apples and Caramel and Leaves, Oh my! Close your eyes and picture an apple. What do you see? Bright red or green skin, a brown stem, a crisp little leaf? That’s what we see too! 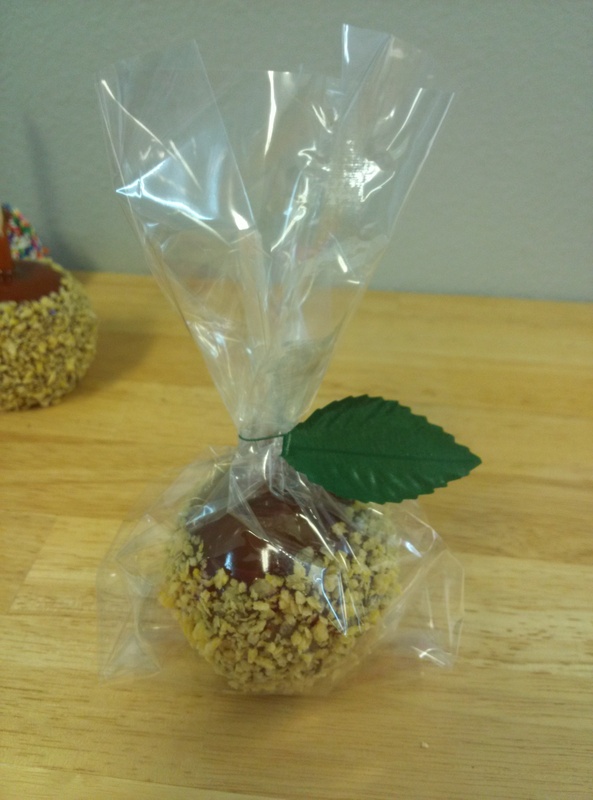 So, we traveled down to our local craft store with the traditional image of an apple in mind to serve as inspiration for DIY decorating our Petite Caramel Apples. We found these bunches of leaves in the floral department. The green leaves were $1.99 for 24, or around 9 cents each. The white iridescent leaves were $1.99 for 11, but we think we might have had an extra in our bundle, we are assuming there were suppose to be 10, which means they were around 20 cents each. 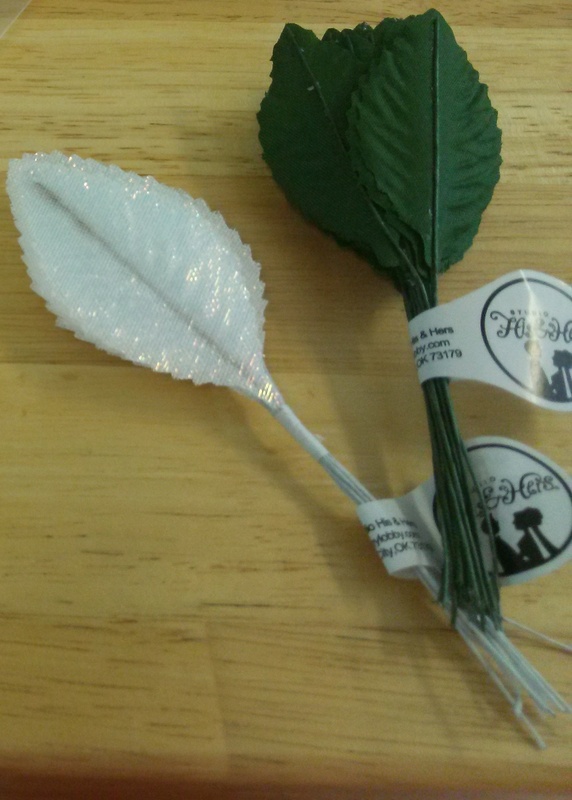 The stem of each leaf is made of wire, so it is super easy to use and works well in keeping our clear cellophane bags closed. We’re partial to our Petite Red Candy Caramel Apples with Crunch with the green leaves attached, but the white iridescent leaves do add some nice sparkle! We also came across burlap leaves. Burlap has a fantastic rustic fall feel to it and it is everywhere right now! These leaves were all attached to the same branch, 7 in total, for $1.99, or around 29 cents each. 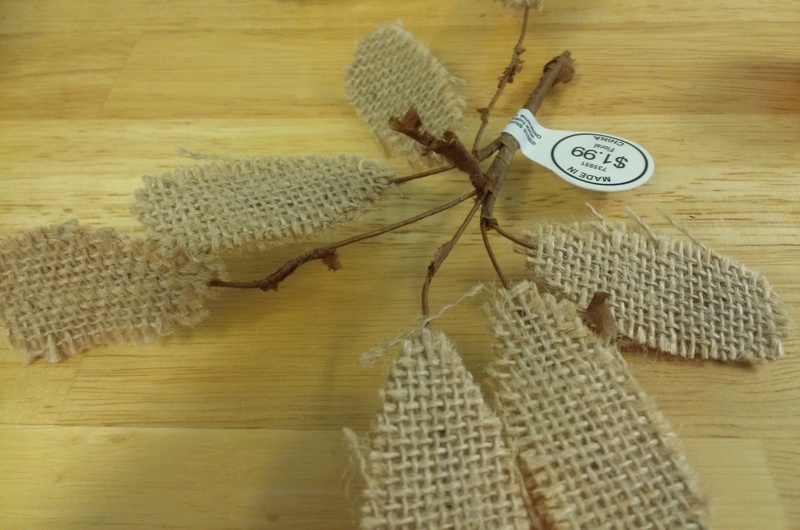 What we discovered while working with them, though, is that they can easily be detached and used like the other leaves with metal bendy stems. How cute would a whole table full of these be at a wedding reception? Or maybe one at each place setting? We also picked up a coral colored burlap flower. These burlap flowers come in many different colors, so they could coordinate with a number of theme color combos. 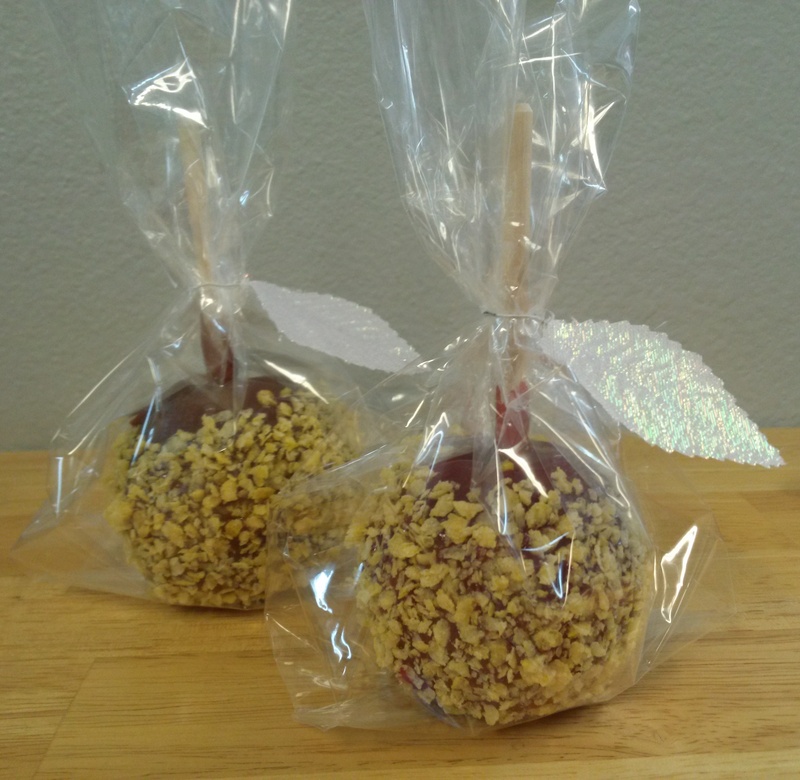 At $1.99 each, the addition of the flower may become a bit extravagant for 250 favors, but for a smaller party or as individual gifts, we think the flower dresses up one of our Petite Caramel Apples in quite a lovely way. 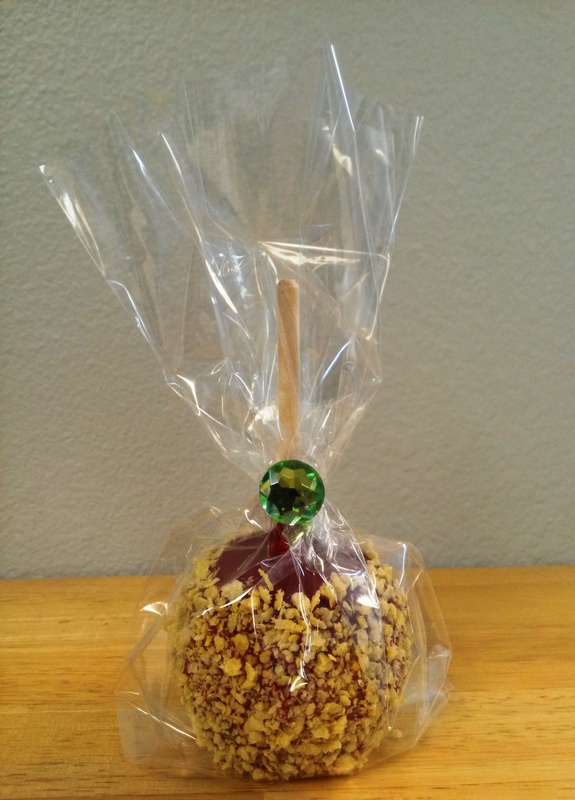 Posted in Caramel Apple Wedding Favors, Daffy Farms, Decorating Ideas, Delicious Pictures, DIY, The Daffy Apple and tagged bulk caramel, caramel, caramel apple, caramel apples, cellophane, coral, crunch, crunch topping, daffy apple, daffy farms, diy, event, fall, green, leaves, petite, shower, sparkly, spring, traditional, wedding, white on April 11, 2014 by daffyfarmsblog.